each of our employees become encouraged and happy. We appreciate your patronage and thank you for choosing Kibunesou. 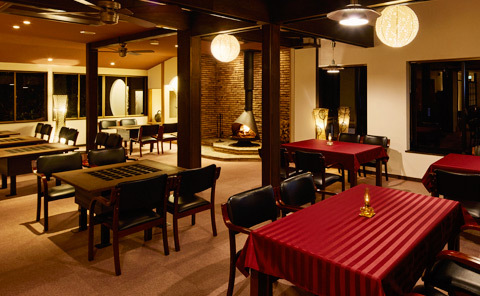 We will continue to provide the best service and “omotenashi” (Japanese hospitality). We look forward to welcoming you with all our hearts. The soothing sound of water falling upon the rocks. Like another world, cooling temperatures even under the midsummer sun. Refreshing in the spring and summer, peaceful in the autumn and winter. A variety of seasonal flavors to enjoy the hues of the four seasons. The fresh greenery of new leaves, autumn colors, and yukata. The colors of the seasons are an amazing memory for everyone. “Ayu,” a popular fresh water fish in Japan. We want you to enjoy the freshest ingredients, cooked to perfection. It is for that reason that our restaurant has created a one-ton fish tank. The tank circulates the cold water siphoned from the Kibune River, and constantly maintains a rapid flow and oxygen level. The ayu fish raised close to a natural environment have no excess fat and are a superb ingredient. The fish is taken alive from the tank and grilled after an order is made by a customer. We carefully prepare our meals so that you can fully enjoy the flavors and fragrances of ayu, also known as the fish of fragrance. Enjoy the diverse taste of each season not only from the salted and grilled ayu fish in summer but also the succulent texture of ayu fish that carry eggs in the autumn and winter. Japan”s leading tea, "matcha." The proper way of enjoying this tea is to grind it in a stone mortar into powder to drink as tea. However, our restaurant uses this ingredient in our cooking. We use tea from the birthplace of green tea Ujitawara, Kyoto, for its characteristics of great fragrance and flavor. The “Tea Leaf Hot Pot” is one of our restaurant’s unique dishes and we float tea leaves in a strong broth with meat and seafood. One of the charms of eating tea leaves is that they are rich in nutrients such as amino acids. Please try the delicious dishes that are also healthy. The edible flower bud of the butterbur and bracken, bamboo shoots and sansho (Japanese pepper). Japanese mountains in the spring are a treasure trove of wild plants. We prepare a range of natural dishes for your enjoyment from tempura and boiled vegetables to tsukudani (boiled and preserved foods). A special ingredient used is sansho which is refreshingly fragrant and spicy. There is not part of the sansho that can”t be eaten, and the young leaves are used to give fragrance, the flower in tsukudani and the peppercorn is prepared in a sansho hot pot dish, a specialty of our restaurant. There may be times when you will be served produce from Mt Kibune, depending on the season. Enjoy the bitter taste of spring that is healthy for you. 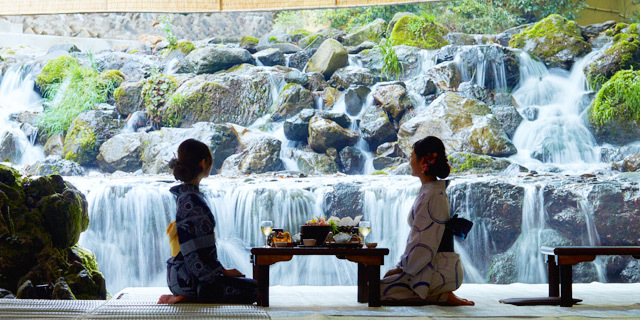 We would be happy if you can feel the changes of seasons through the Kibunesou cuisine in the valley of Kibune. A place where its season’s beauty is second to none ― not even Kyoto. We prepare our cuisine using ingredients that have seasonal flavors and aromas. 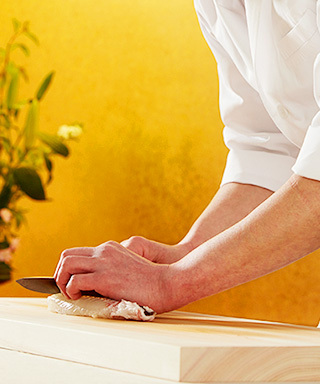 To prepare dishes that will further please our guests, we continually welcome any comments from our guests and make every effort to pursue excellence. We look forward to welcoming you to our restaurant. 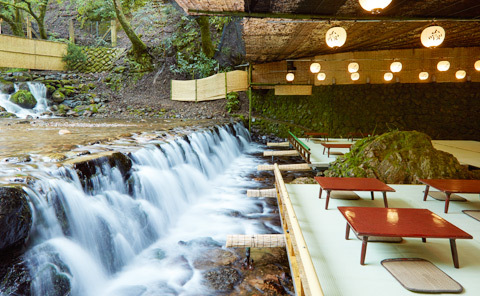 Please enjoy the wonderful taste of Kyoto cuisine while sitting over a stream, surrounded by nature. Hidoko with its charcoal fire and fireplace in winter, and Yamadoko that oversees the natural scene in spring and summer. We welcome you to the particular charms and tastes of each season.